I am a newbie as far as Affinity Software is concerned so it is possible that I have missed something? I am really enjoying the 'learning curve' of this range of Applications and will not hesitate to purchase this new addition to the Suite. This has nothing to do with placing Text on a Curve. The attached Affinity Publisher File has two iterations of Curve Text. I have no idea where the first iteration sprang from but the second is probably a copy of the first. The ScreenShot shows that the name Curve Text had been generated by the APub Application. 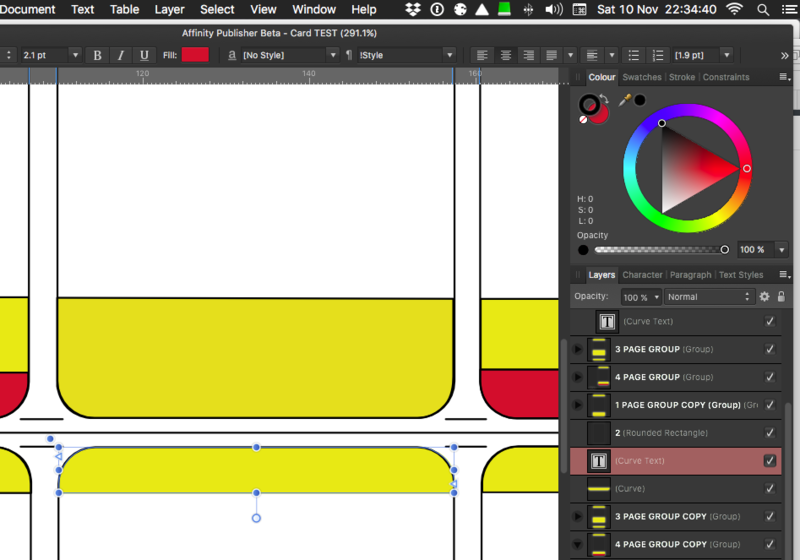 Of note is that the Colour Tools indicate that the Fill Colour is Red when in fact it is Yellow, the Outline Colour is shown as Black but try as I may it will not adopt any colour and therefore remains 'invisible'. It was my attempts to add an Outline in order to match the rest of the document that brought this problem to my notice. Also changing the Fill Colour has nil effect. There does not seem to be any other options available, 'playing' with Constraints I managed to create items that were not visible but interfered with Outlines and/or filled with colour but failed to show, in a manner I was anticipating, on the Layers List. Eventually, the problem was located by deleting one item at a time until it became obvious that the 'constraints' labelled items were causing the problem and that Ungrouping was the answer. Aware that the offenders could easily be deleted and replaced I am seeking to 'learn what I did wrong in the first place to create the problem', with a view to not letting it happen again. If you click a curve object with the text frame tool, you will get a curve text object (a styled object with text inside). Unless you actually enter text in that box, it will appear as "(Curve Text)" in the layers panel. The color format you are trying to change is for the text (the contextual toolbar in your screenshot is for text). Since you do not have any text, you do not see any changes. Try the node tool instead to change the curve object format. Thank you very much for the information about Curve Text, I certainly was not aware that it existed and could not find any reference to it on the Affinity web site. Experimenting with Text input the Area on the Left rejects both Artistic and Frame Text, although either can be dragged or otherwise manouvered onto it. The Area on the Right accepts Artistic Text input, although ion the is case because it was copied and flipped through 180°, any input is upside down. It refuses to accept Frame Text directly into the area. It exists and so should have a purpose but I do not have the time or need to discover aspects that seem undocumented, whilst remain happy to place Text, in standard closed areas, by the usual means.